A splash of color, a dash of 21st century technology and a whole bunch of features to satisfy the most discerning web surfers are combining to make Japan Update the most modern website anywhere. The Japan Update website has undergone a pretty significant renewal, with brand new services added, a full re-design put into place, and RSS feeds been created for both news and classifieds. 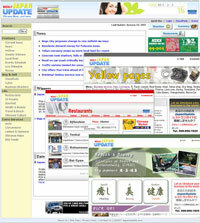 Check out our website and have a look for yourself at www.japanupdate.com. Three new services have been introduced onto the website. The health and beauty section is a listing of local shops such as nail salons, spas, esthetic salons, and chiropractic shops. The restaurants section is a list of local restaurants and bars categorized by the type of gourmet entrees served. Finally, the yellow pages are a listing of Okinawa businesses, defined categorically with business services, auto dealerships, hotels, and more. If you are interested in having your business showcased in any of the above three sections, contact Japan Update at 098-896-1925 for more information. Another exciting new website addition is RSS feeds. RSS stands for “Really Simple Syndication”. By simply downloading a RSS reader, you may subscribe to our news and classifieds feeds, receiving automatic notification anytime any of our data is updated. For instance, if you set your RSS reader to subscribe to our Classifieds’ Auto section, you will receive the most up-to-date autos ad listing without ever needing to access our website. You may also set up your website to subscribe to our RSS feeds and display our data in your own format. Our RSS files will be updated every hour on the hour. You can find a listing of our feeds at http://www.japanupdate.com/?p=rss. As with any new recoding of systems, an occasional glitch or two may pop up. If you find any problems with our website, please do not hesitate to email us at webmaster@japanupdate.com.